Prior to 1914, the industrial production of organic chemicals in the United States was very limited both in the number of compounds and quantities. Petroleum refining was primarily by distillation; there were no cracking processes and no petrochemical plants. Replacement of beehive coke ovens by byproduct coking ovens to recover aromatic chemicals had just started. Most organic compounds were imported from Europe; research chemicals for use in universities and industrial laboratories were imported from Germany (Kahlbaum's Chemicals), Great Britain (Boots Ltd.), and France. There were only a few small scientific supply houses that distributed small amounts of imported chemicals. Indeed, organic research in universities and industry was limited to a few schools and very few companies.1 In 1914, the outbreak of the war in Europe led to embargoes, blockades, and destruction of shipping, which meant that chemical supplies in the United States were quickly exhausted. The escalation of World War I,2 with United States involvement in 1917, demanded immediate production of tremendous amounts of food, grains, meat, oils, coke, iron, steel, nonferrous metals, ships, trucks, guns, tanks, airplanes, gasoline, kerosene, lubricating oils, war gases, phenol, toluene, glycerol and nitric acid, protective agents, dyes, and drugs. Since all the industrial plants and laboratories were in use, the chemistry staff at the universities began to increase their “student preps” to make chemicals needed for research. Clarence G. Derick of the Chemistry Department at the University of Illinois in Urbana, actually initiated “Summer Preps” with about five students in 1914 before the war started. In the summer of 1915, Ernest H. Volwiler, a graduate student, joined Derick's prep group and was placed in charge during 1916 and 1917. Oliver Kamm, a member of the teaching staff after 1915, also helped in the prep work. Carl S. Marvel, who started graduate study in 1915, began making compounds in June of 1916 and worked full time until August 1919. He was a most skillful operator and “speedily”,3 built up a reputation for modifying poor procedures so that they would work. Roger Adams joined the chemistry staff in 1916, and enthusiastically took up the idea of synthesizing research chemicals in larger quantities: one-half to several kilos. The compounds made during 1917-1918 were those needed in the World War I effort. Dr. William A. Noyes, Head of the Chemistry Department of the University of Illinois, persuaded the Illinois administration to provide a revolving “Organic Chemical Manufactures” fund, which was used to purchase chemicals and to pay the summer preps chemists. These graduate students, numbering from 10 to 12, worked full time, 8-10 h/day for the 8-week summer session. Their pay started at 25¢/h in 1915 and gradually rose over the years, but the students received one unit of graduate credit for their work. Adams and Marvel put the operation on a sound cost basis by requiring all students making preps to keep careful notebook records of the cost of chemicals, apparatus, and the time needed for each preparation. The compounds made were then sold to anyone who needed them and the money returned to the fund. 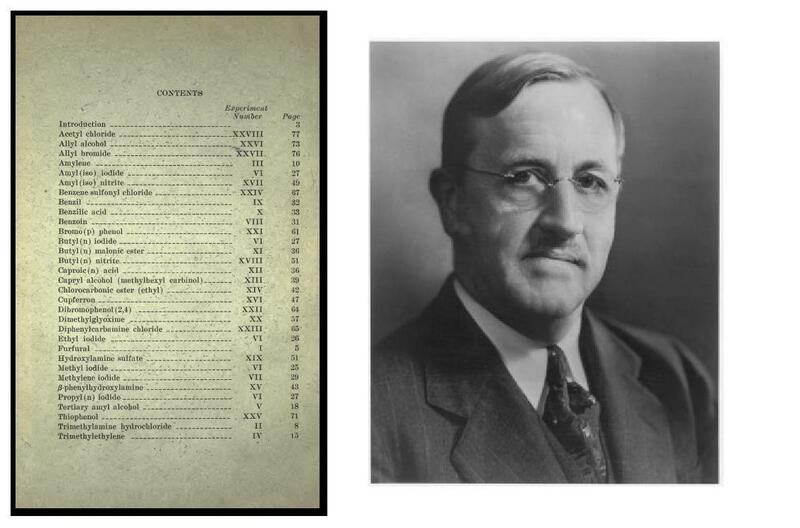 In 1917 Roger Adams4 published a list of 43 organic chemicals available for purchase, and in 1918 a note listing 59 compounds as available at once, 37 to be made, and 29 more that would probably be available by the end of the summer5. When the importation of dyes for sensitizing photographic film stopped in 1914, Hans T. Clarke, who had just joined the research division of the Eastman Kodak Co., was called on to synthesize the dyes. The lack of organic raw materials for this project and others led Clarke and C. E. K. Mees to recommend to George Eastman the formation of an Eastman Organic Chemicals Division. It would assist research chemists by repackaging commercial chemicals in small lots, purifying industrial chemicals, and synthesizing any needed but nonavailable chemicals. Clarke visited Adams and Marvel at the University of Illinois and spent several weeks observing how “Summer Preps” was operated. The Eastman Organic Chemicals Division began operations at the end of the 1918 and contributed greatly to the advancement of organic chemical research. Its synthesis group worked out many good procedures and designed unique laboratory apparatus and techniques. After Clarke left in 1928, William W. Hartman took charge. The production and distribution of Pyrex laboratory glassware by the Corning Glass Works, Corning, New York in 1915 was a very important factor in the preps work. PyrexTM labware was far superior to the old lime-soda glass against breakage by mechanical or thermal shock, and resistance to reagents. It surpassed even the Jena glass that had been imported from Germany prior to 1914. PyrexTM round-bottomed reaction flasks became available in large 5, 12, and 22 L and smaller sizes. Glass blowing with Pyrex was easily mastered; hence, special distilling flasks, fractionating columns, the now familiar three-necked flasks for use with a mechanical stirrer, and the reflux condenser and dropping funnel were made and used as standard items in the prep labs. Also in 1914, when shipments of laboratory porcelain ware from Germany ceased, the Coors Porcelain Company of Golden, Colorado, converted their ovenware and pottery plant to chemical porcelainware. High quality Coors U.S.A.TM glazed laboratory porcelain evaporating dishes, Buchner funnels, casseroles, mortars and pestles became available. The armistice of November 11, 1918 ended the war but did not end the shortage of research chemicals. Hence, the synthesis of special research compounds, not available commercially, was continued during the summers under the direction of Carl S. Marvel, who became a member of the Organic faculty at Illinois after completing his graduate study. The expanding organic and biochemical research divisions of universities and commercial concerns requested the compounds to be made in the “preps” lab. About 1940, Harold R. Snyder took over operations from Carl S. Marvel and carried the synthetic work through the difficult World War II years (1941-1946). The prep group made unclassified starting compounds and intermediates needed by any of the various war-time agencies. Leonard E. Miller of the Organic Chemistry Department at Illinois directed the Summer Prep work during 1948-1950. After 1950 the program was discontinued because by that time many organic and biochemical supply companies had been established for the synthesis of specialty chemicals. The Summer Prep operation had provided a superior education for over 500 graduate students (and some seniors) for 36 years. Other universities also incorporated advanced organic preparations in their graduate programs. These well-trained chemists contributed to the pool of expert synthetic organic chemists for the organic chemical industries that had established real research laboratories from about 1922 onward. The foregoing account is incomplete, however. What were the sources of the procedures, operating directions, techniques for carrying out reactions, isolating, and purifying the products? Most of the compounds made were not new; they had been described in the various journals, both American and European; some were described in patents. Beilsein's “Handbuch” gave only a sentence or two summarizing the method. Houben-Weyl's “Methoden” were likewise limited. The previous literature procedures were so incomplete that frequently a synthesis, using what seemed to be a simple reaction, became a research problem of weeks or months. Four laboratory manuals available in 1915-16 that proved helpful were Ludwig Gatterman's Die Praxis der organischen Chemie, 1894, later revised by H. Wieland (21-24th eds.). L. Vanino's Handbuch der preparativen Chemie, Part II, summarized the literature preparations of several hundred organic compounds. E. Fischer's Anleitung zur Darstellung Organische Preparative (1908) was useful as was J. B. Cohen's Practical Organic Chemistry, 2nd ed. (1908). These manuals, designed for the first course in organic chemistry, were very useful but limited in scope. It was common experience that many procedures in the chemical literature could not be duplicated; indeed, certain procedures were hazardous. Hence, from the very beginning of Summer Preps in 1914, and continuing through all the years, each student had to write out in detail the procedures they used, add precautionary notes, and references to the literature. The procedures were carefully filed and used in succeeding years; each prep person added their observations plus data on yield and purity. The first batch of directions culminated in the publication of four pamphlets; Organic Chemical Reagents, by Roger Adams, O. Kamm, and C. S. Marvel. These were bulletins published by the University of Illinois Press from 1919 to 1922, containing directions for preparing a total of 111 compounds. Although not advertised, these bulletins were quickly sold out, as their availability became known at meetings of the Organic Division of the ACS and from citations in articles published in the journals. 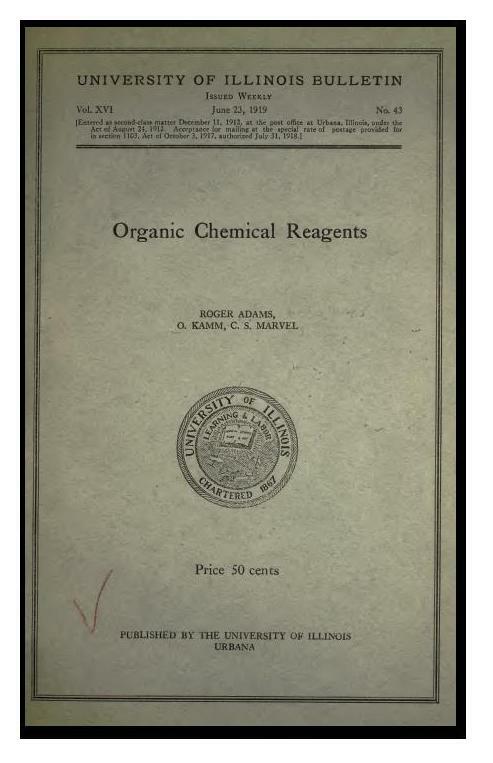 The success of these little booklets, and the accumulation of several hundred additional good directions for the syntheses of organic compounds, led Roger Adams6 to consider the publication of an annual volume of satisfactory methods. He discussed this project with James B. Conant of Harvard, Hans T. Clarke of Eastman Kodak, and Oliver Kamm of Parke Davis. The unique feature was the preparation of sets of directions which, if carefully followed, could be duplicated by an advanced student (senior or graduate). Moreover, before publication, each preparation must be checked in the laboratory of an editor and always in a laboratory other than that of the submitter. In addition, the fact that this original group represented both industrial and university laboratories constituted excellent support for the project. 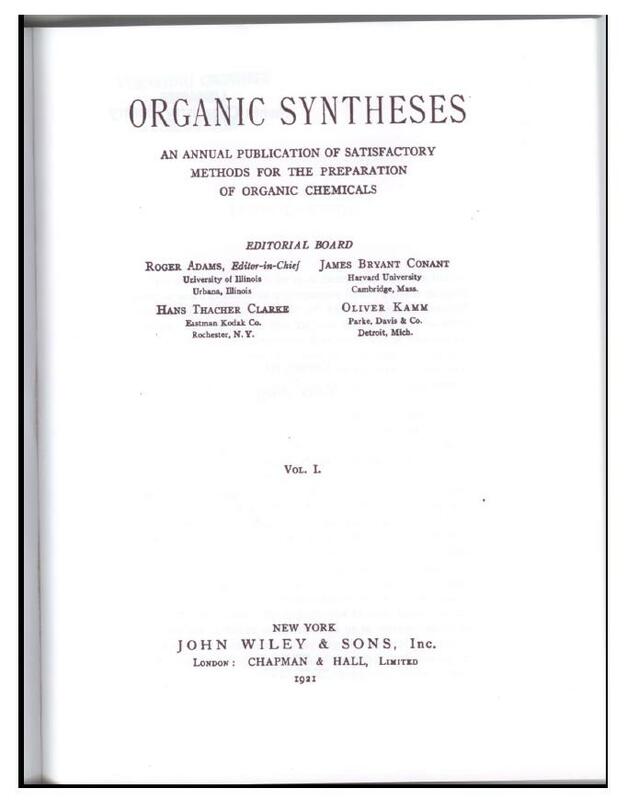 The first annual volume of Organic Syntheses was published in 1921. The procedures were collected, checked, and edited by the first Board of Editors; Roger Adams (University of Illinois), James B. Conant (Harvard), Hans T. Clarke (Eastman Kodak Co.), and Oliver Kamm (Parke Davis). Publication was made possible through the friendship of Mr. Edward P. Hamilton of John Wiley & Sons, Inc. This was a most unusual publication venture for those times; there was no assurance that the publisher could recover the costs of the printing, binding. and distribution of this slender little “pamphlet” of 84 pages. Each of the first four members of the Editorial Board acted as Editor-in-Chief of one or two volumes. Then the Editorial Board was expanded during the next 10 years to include Carl S. Marvel (University of Illinois), Frank C. Whitmore (Northwestern University, Pennsylvania State University), Henry Gilman (lowa State University), and Carl R. Noller (Stanford). In 1929, C. F. H. Allen was appointed Secretary to the Board when the number of chemists contributing preparations rose from 8 to 24, thereby causing a great increase in correspondence and record keeping. Each of the new editors took turns in preparing volumes. The policy of changing membership on the editorial board by selecting additional organic chemists to serve on the active board and moving those who had already served a term and edited one or more volumes to an Advisory Board of Editors was adopted. A new secretary to the Board of Editors was appointed every 10 years. Beginning with Collective Volume II the retiring secretary became the Editor-in-Chief of the collective volume for the years in which he served. Thus, this project involved many different university and industrial research chemists so as to make it representative of as many institutions as possible. These policies continue today6. In addition to the first eight editors mentioned above, there are 51 other organic chemists who have served on the Boards of Editors. They are an enthusiastic group of chemists working with their students in universities and coworkers in industry, dovetailing their regularly assigned work with writing up procedures, and editing and checking them in their “spare time.” None of the contributors of procedures, editors, or checkers received any pay or any of the royalties from the sale of the volumes. The starting chemicals needed for checking procedures were contributed by the chemistry departments of the universities or the research departments of industrial companies, and the products of the syntheses then were added to the research stocks of the contributors or editors. The products were always more valuable than the crude commercial starting materials so this was an economical way of getting valuable intermediates for research. From 1921 to 1939 the Organic Syntheses Editorial Boards operated in a very informal fashion. However, changes in the income tax laws led to the formal incorporation of Organic Syntheses as a “Membership Corporation” under the laws of the State of New York on December 11, 1939. The certificate specified: The purposes for which the corporation is to be formed are the following: To collaborate in the writing, editing, and causing to be published from time to time of books and articles dealing with the methods of preparation of organic chemicals and other subject matter connected with organic chemistry; the royalties or other proceeds received from them to be placed in a fund, the principal and income thereof to be used exclusively (apart from bona fide expenses of operation of the corporation) for the establishment of fellowships, scholarships and other benefits for students in organic chemistry in various colleges and universities; to acquire property, both real and personal, for the conduct of its corporate purposes. The corporation is to be organized and operated exclusively for strictly scientific, educational and charitable purposes, and not for pecuniary profit, and no part of its net earnings will inure to the benefit of any member, director, or officer other than as reasonable compensation for services in effecting one or more of such purposes, or to any other individual except as a proper beneficiary of its strictly charitable purposes, and no part of its activities will be the carrying on of propaganda or otherwise attempting to influence legislation. The First Board of Directors consisted of Roger Adams (University of Illinois), President; William W. Hartman (Eastman Kodak Co.), Treasurer; A. Harold Blatt (Queens College), Secretary to the Editorial Board; Louis Fieser (Harvard), and John R. Johnson (Cornell). Royalties from the sale of the Annual Volumes and Collective Volumes were paid to the Organic Syntheses treasurer and used to pay postage and typing expenses in collecting preparations and editing the volumes. Periodically any balance in the fund was invested in stocks in the growing chemical industries. A set of By-Laws of the Corporation was adopted and filed with the State of New York. They were amended from time to time as conditions changed, but always conformed to the above cited non-profit purposes. Supervising all operations of the corporation so that they are in conformity with the Certificate of Incorporation and the By-Laws. Authorizing those expenditures from the Treasurer's funds that are essential to its scientific, educational, and charitable purposes. Conforming to Acts of Congress concerning nonprofit corporations. Expenses for the current Annual Volumes of Organic Syntheses. Secretarial help for the Editors-in-Chief of the Collective Volumes and Cumulative Indices. A biennial award to an outstanding organic chemist who presents a scientific educational lecture at the biennial Symposium of the Division of Organic Chemistry of the American Chemical Society (a nonprofit corporation chartered by an Act of Congress). This award, known as the Roger Adams Award, amounts to $25,000, a fourth of which being contributed by Organic Reactions, Inc., a nonprofit corporation, also founded by Roger Adams. Subsidies to enable undergraduate or graduate students majoring in any field of chemistry and to postdoctoral fellows and research associates in chemistry at schools in the United States and Canada to purchase volumes of Organic Syntheses at one-half the list price. Establishment of a lectureship program at the home institution (or one designated) of members of the active Board of Editors. Special awards in recognition of outstanding contributions for the advancement of the purposes of Organic Syntheses, Inc. Corporation expenses for accounting and legal assistance to the Treasurer of the Corporation. To complete the story of 72 years work of Organic Syntheses, the prefaces to the Annual Volumes, the Collective Volumes, and this volume and its dedication page should be read. Fisher, Harry L. “Organic Chemistry. 1876-1951,” in “Chemistry: Key to Better Living,” Diamond Jubilee Volume, pp. 52- 57 (1951) American Chemical Society, Washington, DC. Browne, Charles Albert, and Weeks, Mary Elvira, “The American Chemical Society and the First World War,” in A History of the American Chemical Society, Seventy-five Eventful Years, Chap. 1X, pp. 108-126 (1951). Carl S. Marvel was known to all organic chemists as “Speed” Marvel. There are many legends as to origin of this nickname; lecturing, eating, driving a Marmon car, hunting, trapshooting, birding, and the present text. Adams, Roger, J. Ind Eng. Chem. 1917, 9, 685. Adams, Roger, J. Am. Chem. Soc. 1918, 40, 869. Adams, Roger, “Fifty years of Organic Syntheses” Org. Synth. 1970, 50, vii-ix. Since 1975 some significant changes have been made in the operation of Organic Syntheses. Junior checkers (students associated with members of the Board of Editors) now receive an honorarium for their efforts. This change recognizes the more complex and sophisticated procedures that now appear in these volumes. Also, because of the greatly increased cost of chemicals involved in the checking process, checking editors are now reimbursed for their costs; it is no longer reasonable to expect their own departments to absorb these expenses. Beginning with Volume 62 (1984), each Annual Volume has appeared in two formats: the traditional bound volume complete with index, and a paper-back version without indices, which is furnished free-of-charge to the Division of Organic Chemistry of the ACS and several foreign societies for distribution to its members. In addition the publication of Collective Volumes has now been changed to a 5-year rather than a 10-year cycle to reflect the accelerated pace of work in the field. In 1998, in keeping with its charter, the Board of Directors decided to place the past and future volumes of Organic Syntheses on the Internet, with free access to all. The new millennium begins a new chapter in the life of Organic Syntheses.